First up is the Greater L.A. Festival which gathers a big crowd every year on the second Friday and Saturday of September. Live gospel and folk music, fun activities for the kids including face painting, hay rides, and inflatable attractions along with great food and fellowship make for a great weekend outing for the whole family. Some 2,000 attendees are expected. 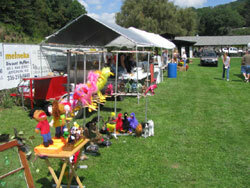 The festival takes place at the American Legion Ball Field in Lansing on NC 194N just below the old school. Vendors and crafts will be set up both days from 10.00 a.m. to 5 p.m. Activities those days include hay rides, children&rsquo;s activities, apple butter demonstration (and you will want to purchase some of the results), along with barbecue chicken, hamburgers and hotdogs, and funnel cakes. Plan to visit Lansing, NC for the annual &quot;Greater LA&quot; festival this year.&nbsp; While visiting be sure to spend some time in West Jefferson, stop by A1 Mountain Realty located on the main street in downtown West Jefferson.&nbsp; A1 Mountain Realty has years of experience selling Ashe County NC Real Estate. We understand the beauty and allure this area holds and our trained Ashe County Realtors can assist in all your NC Mountain property searches or list any NC Mountain property that you wish to sell. We will provide timely feedback on our progress. We want you to feel comfortable in your choice with A1 Mountain Realty. You can check out all of our Ashe County homes and Ashe County acreage from our website www.a1mountainrealty.com or call our office 336-846-4900 and speak to one of our professionals. Take a look at the historic downtown area from the home page of our website by clicking theDowntown West Jefferson Webcam tab. Thanks as always for reading our blog!